Casanova and Harmony Rose did it again! A FULL SISTER to Aussie .38 Special had arrived! We could fill up this section with all the wonderful things Casanova has done for our Farm over the last 9 years since we purchased him. 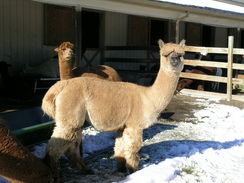 Simply, he is now 14 years old and we still own him along with our partners at Finger Lakes Alpacas! We think that says it all. What can I say about Mabelline? First, she will be the last animal on the farm if I have my way. All of the offsping she has given us have been champions in the show ring. We have bred her to different males and each time her genetics come out strong. Now this is what a 12 year old female should look like. She is the dam of EON Loreal, EON Max Factor, EON Makulu's Sephora, EON Azzaro, EON Almay, and EON Makulu's Slam Dunk II. She is currently bred to Xxxtreme Xclipse for a 2014 cria. She is an amazing Dam. Loreal is a beautiful girl with great conformation, crimp and uniformity of staple. She has delivered 5 beautiful crias and comes with a breeding to any of our herdsires. Her 2012 cria, EOn Makulu's Cover Girl is a stunner. She took Best Bred and Owned at the 2013 ABR Fall Fest. 2013 Brought a gorgeous white boy, BSRA Tuscan's Iceman. He took a 4th at the 2014 GWAS in a tough white juvie class. Her first cria, EON Overdrive took a second and a Reserve Color Champion at the 2010 NM State Fair and her 2nd boy EON Bobby Brown took a 4th at the 2011 GWAS. 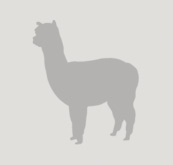 So far she is batting 1000 on ribbon winning cria.She has it all! In 2015 she delivered a beautiful bay black daughter by Archangel of FRA. 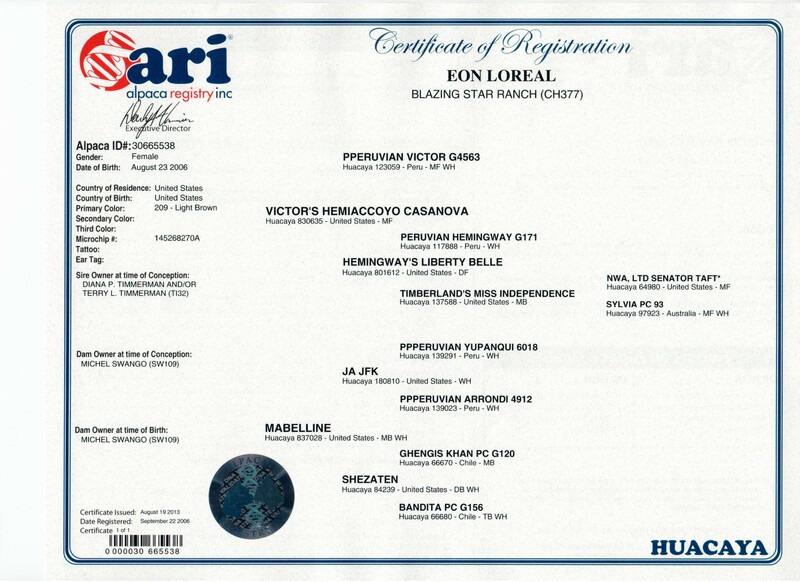 Loreal is paternal half sister to .38 Special and full sister to EON Max Factor. I wouldn't let her go, except that I am keeping her daughter, Cover Girl. Loreal comes with a breeding to any wholly owned BSRA herdsire. We would suggest Patron. Sunny Mesa Tuscan Gold Son!